In 1989 I was standing next to my Tang Soo Do instructor of a few months, me being a white belt in TSD, at a tournament in the now defunct PKA/AKL tournament circuit somewhere in northern New England. We were watching a team competition, where two men, one brown belt and one black belt, were performing last. They were outstanding. I mean outstanding in Stance, Movement, Presentation, Entertainment and Difficulty. Really outstanding. My instructor became verbally, then physically agitated. He was well known enough a regional competitor to carry some weight in the circuit, and he was a good friend of the organizer. So he complained. Before he actually complained, he said, "That's not right! A brown belt should not beat a Black Belt." Then he complained. As it turns out, his complaint was based on the fact that the brown belt had drilled the center of his chucks to make them lighter, not that Black Belts are inherently superior. In an age where athletic endeavor has overtaken 15th century weapons, I kind of under stand. Be a man, use real weapons; but really, it was about skill not weight. 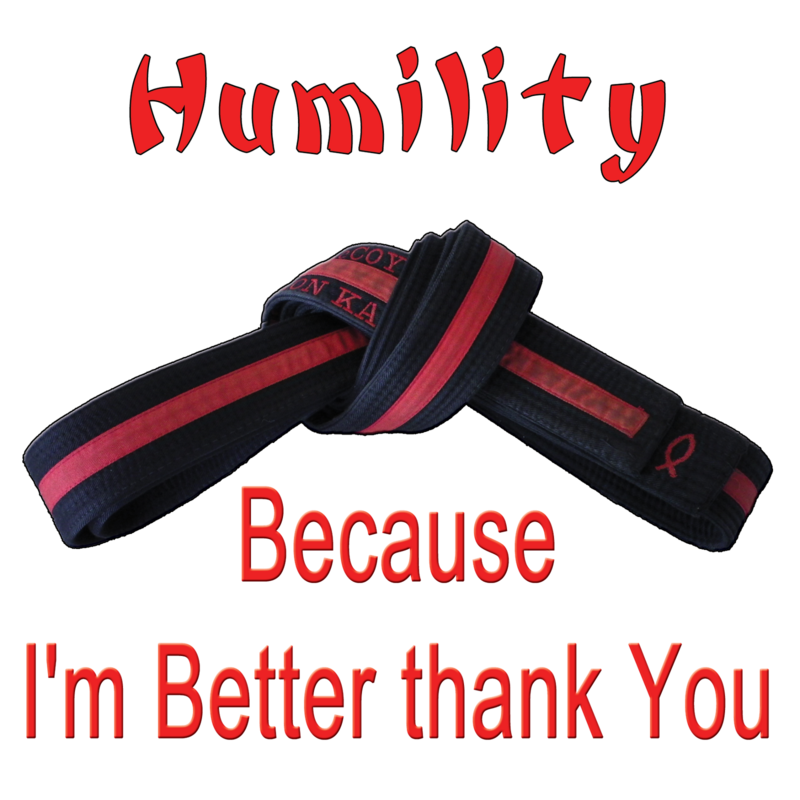 That was my first lesson in what humble really meant to most black belts in America; that being; "I'm a black belt, your not, bow down to me." I had a even better lesson in humility and strength also standing near my instructor at a tournament. This tournament was at Denison University in 1976(ish), and my instructor was a Shorin Ryu instructor. I was again a white belt, this time in my first art. This was an open tournament, and I had never seen kung fu fighters before. Hand movement all over the place. It made me nervous. I must have looked it, because my instructor asked what I worried about. I told him, and he said: "When they are waving their hands around, kick them." Then he laughed, and told me that victory and defeat was based on the man fighting, not the art or the rank. That's humility. I have now been doing martial arts for a while, and I have meet many more people like the first example and very few like the second. 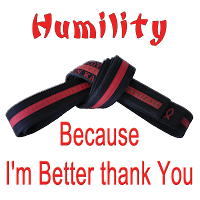 It seems to me that humility is a word we all assume is taught in karate, but seldom is taught or expected from black belts. We are above it all. From out right physical fight between coaches at tournaments to attitudes of self importance, martial arts seems to be caught in a path that is common in our world today, rather than being in a world we are making better. Another example is how we teach, and what we consider good. I have taken classes in hundreds of schools and dozens of systems, from Tai Chi to Krav Maga, and certified in most of them. All the arts I have studied work. Again, it seems to me it is the person working it that makes a difference, but they all work. The problem comes in that most instructors I know concentrate on the art they are teaching, rather than on the person they are teaching. If the art is intended to teach inner peace, self control, self defense and wisdom, then it seems natural to me, that we should spend more time on the person learning the art, and less time on the art. Self development takes a different path in every student, and the purpose and use of the power we direct them to is also different in each student. Over the years, I have discovered that the ONLY purpose of Power is service. 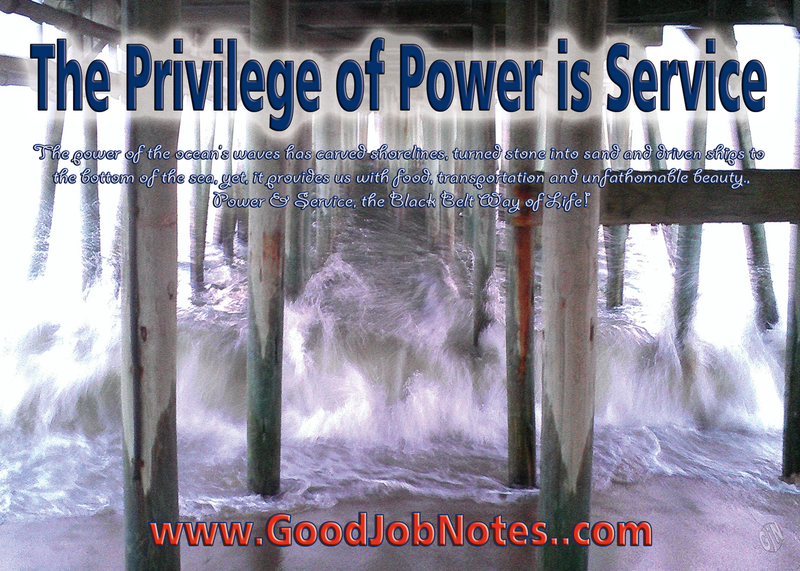 We use or power as martial artist to save a life, build a person, avoid a confrontation, deliver justice, avoid destruction or to generally make another's life better than it was before we interacted in the situation. It's not at all about the art, in the end. It's about the people in the art. Thank you for taking the time to post these important messages.